On 7th March, students taking part in the Lent Term collaboration between LSE’s GROUPS and Imperial College’s Horizons presented their finished projects. In this post, staff from the Teaching and Learning Centre reflect on how students from different institutions and different disciplines worked together to create original research. How quickly can you carry out a valid, original research project? 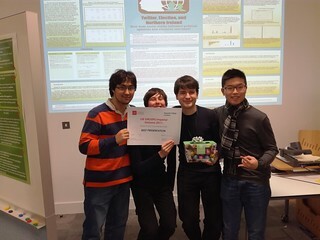 LSE and Imperial College students tested the laws of (social) science this Lent Term. Groups of students met once a week for just two months, and undertook a complete research project, from choosing an initial question to presenting their findings at a poster conference. The project was an adaptation of LSE GROUPS, the popular summer term undergraduate opportunity, in which students spend ten days on a similar task. (Applications are currently open for LSE GROUPS 2017.) This new, streamlined GROUPS (working in collaboration with Imperial Horizons) found fresh enthusiasts among the students who participated.